Imaging Lingo gives developers the ability to generate their own graphics, on the fly, in Director. As you may have seen in some of the other articles on the site, this is a very handy thing and can give you a great degree of flexibility when it comes to building elements for your movies. This new feature has some considerable depth to it, so let's start off our look at Imaging Lingo with an examination of some basic routines to draw bitmaps using the copyPixels() function. Author's Note: Before you continue you should realise that I have the math skills of a stunned beagle. And a fairly math deficient beagle at that. I mention this only so that you understand that some of the things I do in this article can probably be done in a more mathematically efficient manner and also to prove that you don't need advanced math skills to make use of Director 8's Imaging Lingo. One of the easiest ways to start using Imaging Lingo is to build graphics from a series of tiles or by modifying a single tile to create different images. This can even be combined with some small math calculations to create a single bitmap that acts as if it has numerous active areas that the user can interact with. Think of a game of Tic-Tac-Toe. Instead of making a series of 9 sprites into the game board you could simply use one sprite. Or a better example might be a game or Othello or Reversi that is played on an 8 by 8 board for a maximum of 64 possible areas where the user could click. You could still place 64 sprites in the Score and then place behaviors on each of those 64 sprites. Since Director has a ridiculous number of sprites that you can access in the Score, there is really no reason why you can't do this. But using one sprite certainly makes your movie easier to organise. And it also makes it much simpler to actually build the game board in the first place. So let's build a small movie to generate an Othello board and add some code so that the squares on the board will toggle states from the base color, to white, black and then back to the base graphic again as you click it. Being that I am a lazy individual, I don't want to have to actually make more than 3 graphics for this entire movie: a base graphic to represent the board when there are no playing pieces on it, a tile with the white playing piece and a final one for the black playing piece. From these three building blocks you will need to create the rest of the bitmaps in the movie. All these tiles will be 32 pixels wide and 32 pixels high (square tiles are easier to deal with) which makes our final playing area graphic 256 pixels (32 times 8) square. In order to get started you need to understand two new Lingo keywords: image and copyPixels(). The image property is a reference to the actual data. The "image object" is the actual data in memory that makes up the member. This is important to remember because any changes you make to an image are immediately displayed in your movie. So if you store a member's image in a variable and then modify that variable you are not modifying a new image but the image of that original member. The variable thisImage is our new image object - think of it as a blank palette in the computer's memory. It has the dimensions 256 x 32, and a bit depth of 16. Now let's see how to paste something into that blank image. We'll get to some of the parameters next week, but the most important thing to understand is how the rects (or quads) correspond to each other. The rect (or quad) is calculated from the top left pixel of the member's image. Not from the regpoint of the member or even the sprite's location. So if you wanted to copy the data in a sprite on screen from the mouse location you would first have to find out where the mouse is relative to the top left of the member's image. And if you just wanted to copy the entire image then you would just refer to the whole rect of the image. To illustrate this, let's take a short detour from our Othello example and look at another example. Move the mouse over the nitmap image to display a 50 x 50 "snapshot". Download all the Director 8 sample movies in Mac or PC format. This movie takes a 50 x 50 pixel "snapshot" of the bitmap data in the picture (purloined from Gary Rosenzweig's quad example from last week) and then copies that data into a second image. The process has three steps. 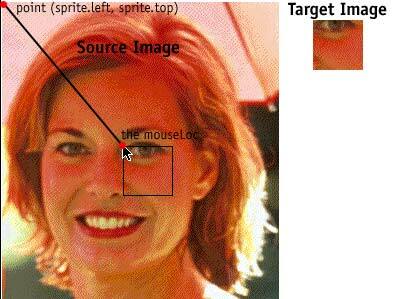 To find the current cursor position relative to the image you simply take the mouseLoc and subtract a point made up of the top and left of the sprite (pMySprite is a property of the behavior in the sample movie). Once you have that point you need to make a rect that is 50 pixels wide and high using that point as, in our example, the top and left of the rect. …and Director would copy the pixels you asked for and, as mentioned before, immediately update the member. Notice that since we're copying to the image of a member, the new bitmap data is drawn on the stage right away and also modified in the cast. The simplest way to build the 8 x 8 area for the Othello example would be to create a new bitmap member and image object and then use two loops (one for each row and then another for each tile in that row) to build up the larger image form the base tile. This is the reverse of our last example. In this case we are taking all the data from a source and copying it to a precise rect on the target. First step is to create the new image and the new bitmap member. The playing area is 256 pixels square. Then we need to get the image of the tile and store the rect of the tile. We don't actually "need" to store the rect but this will be faster than getting Director to re-reference it each time you refer to it and it also makes the code a bit easier to write and read. The top and left variables are calculated by using the tile's height and width, luckily both 32, and multiplying it by the row and column we are currently drawing. You need to subtract 1 from the row and column number to ensure that the top and left of the first tile in each row and the entire first row start at 0. Once it is finished drawing this new image, the code just assigns the image to the image property of the member that was created. Now where did I just click? Now the final part of the example is to build some code to handle drawing the tiles on the playing area when the user clicks on them. The idea is that when an area is clicked it will toggle, with subsequent clicks, from the base tile, to a white playing piece tile, to a black playing piece tile and then back to the base tile again. In order to facilitate this you need two things: a global list of the tiles in the order that they will appear and a second global list to represent the state of the playing area. This second list, as ominous as it might sound, is just a large list that contains individual lists for each row. In the list for each row is an entry for the current tile being displayed at that position. Building this list is quite simple. In order to determine where the user clicks we need to refer back to the earlier example and modify its code to get the mouse click's location relative to the top left of the sprite. As well, since we are dealing with tiles, we need to determine which tile was clicked on. Since the state of each position on the playing field is being held in the global list, we aren't concerned so much with the point the user is clicking on but which row and column they have clicked on. Let's assume for a second that the user clicks on a point that is 148 pixels across and 118 pixels down from the top left of the sprite. We can use Director's integer division to find out how many tiles each of those distances represents by dividing by the height and width of the tile (width for the horizontal distance and height for the vertical distance). We then add one to each value to get the precise tile that the user clicked on. This needs to be done to because if the user clicks on the first tile, any point less than 32 in this case, Director returns 0. The behavior takes the location of the mouse click, calculates where it is in relation to the sprite's top left corner and then hands this location, as two integer values to a handler for processing. Once we have the tile the user has clicked on it simply a matter of finding what the current tile name is, seeing what the next value in the list of tile names is and then storing this new name back in the list. Click the image to toggle the tiles through each of the three states. Now to make things a bit more interesting, and also to see how fast Imaging Lingo can be, you can get write a small exitFrame handler to pick a random tile and then draw it. Those are the basic steps you need to take to build bitmaps using the copyPixels() function and rects. Next week we'll look at some of the optional parameters that you can use with copyPixels() to do things like change the ink effect and blend of the pixels you are copying..